North Bayou CF100 is an extremely heavy-duty mobile TV stand for massive televisions. It supports TV with 60 - 100 inch diagonal and weighing up to 300lbs (136.4kg). Such weight capacity is achieved thanks to specially designed construction and used materials. It has undergone extensive safety testing and has been certified by Underwriters Laboratories (UL), which ensures the highest level of safety and reliability. The mounting brackets of CF100 TV cart is VESA compliant and fit VESA hole patterns from min 200x200mm to max 1000x600mm. CF100 television cart comes with sturdy and adjustable middle shelf with a load capacity of 25lbs. It is perfect for cable boxes, streaming devices, Xbox, PlayStation or any other audio/video equipment you use. You can set your web-cam on the adjustable top shelf to hold teleconferences; the weight limit of the top shelf is 10lbs. 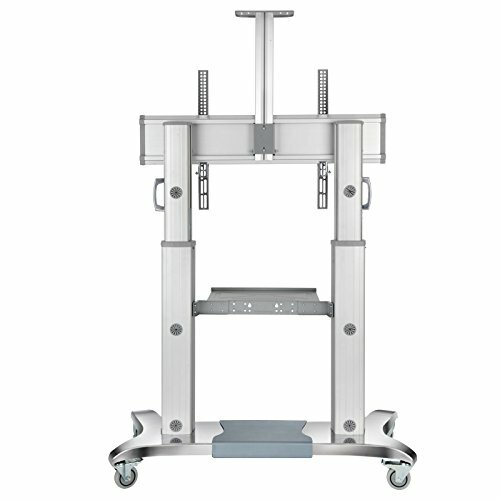 Aluminum base of the TV cart can be adjusted in width to suit your needs and preferences. TV Stand is equipped with 4 locking castors wheels so you can maneuver with ease to any room - all 4 wheels can be easily locked to prevent accidental moving. Due to integrated cable management design you can keep television and cable wires hidden inside TV stand column. TV stand CF100 by North Bayou is a great combination of design, convenience, and value. If you have any questions about this product by North Bayou, contact us by completing and submitting the form below. If you are looking for a specif part number, please include it with your message. Luxor 12 Capacity Secure Tablet Charging Box with mounting hardware for drywall Surfaces Included.